A cowboy partnership includes a well broke horse and a good dog. Together they all have good cow sense. This is a rare moment captured by the camera when a cowboy leans back on the barn door to reflect with his animals. 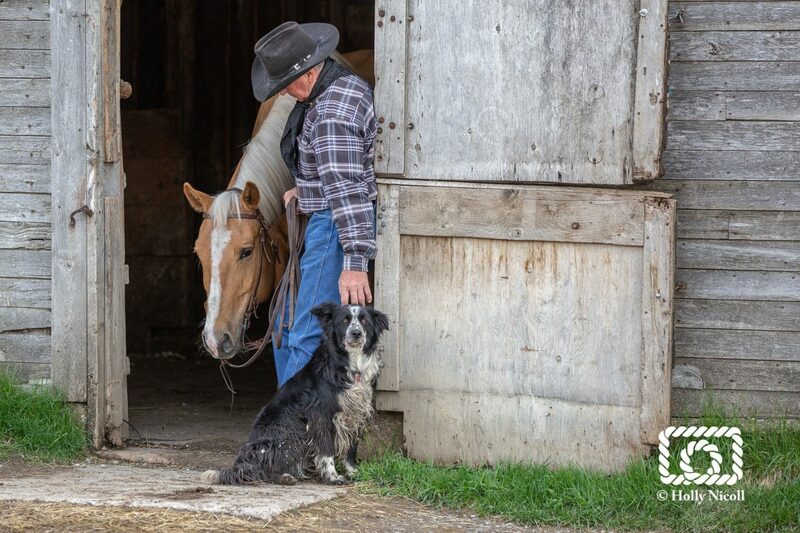 Ranchers rely on good horses and reliable cow dogs to get work done every day. Certainly, dogs and horses are a working ranches greatest assets. Together, they move and sort cattle on the open range or in corrals. The team is much more efficient than any motorized vehicle. This image was taken near Longview, Alberta where real working cowboys live throughout the rolling foothills with the Rocky mountains in the background. Hence, I often refer to it as ‘God’s Country’ because it is one of the most beautiful places on earth.